John Trefry spent a sunlit morning this spring as he has so often during more than three decades as a scientist and teacher at Florida Institute of Technology—on the Indian River Lagoon studying the pollutants that are choking the life out of one of America’s natural treasures. It was not a pretty sight. Dead seagrass floated on the surface, and an algae bloom had turned the water so pea green that even in shallows two feet deep it was impossible to see the bottom. “That was pretty depressing,” Trefry said. Depressing, but hardly surprising. Since 2011, the estuary has been plagued by foul-smelling algae blooms—sometimes toxic—that have closed beaches and killed 47,000 acres of sea grass. Last summer, the mysterious deaths of hundreds of pelicans, dolphins and manatees drew the attention of the New York Times and National Public Radio and aroused a passionate response from the public. 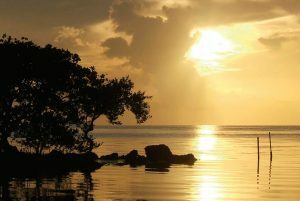 The Indian River Lagoon—a 156-mile-long estuary that supports more than 3,500 species of plants and animals, contributes $3.7 billion annually to Florida’s recreation-driven economy and provides 15,000 full- and part-time jobs—faces a health crisis. The question is what to do about it. FIT has stepped up its efforts to discover the answers by establishing the Indian River Lagoon Research Institute. It brings together nearly two dozen scientists of all stripes—oceanographers and meteorologists, hydrologists and ocean engineers—in a quest to restore the complex ecosystem. Combined with FIT’s extensive network of students and alumni doing lagoon science or working to educate the public through symposiums, films and videos, the institute positions the university to build on its long history of studying what ails the estuary. Kevin Johnson, an associate professor of oceanography and environmental science, polled fellow members of the institute to see just how much experience FIT has in lagoon science. “Cumulatively, we have 400 and something years,” he marveled. 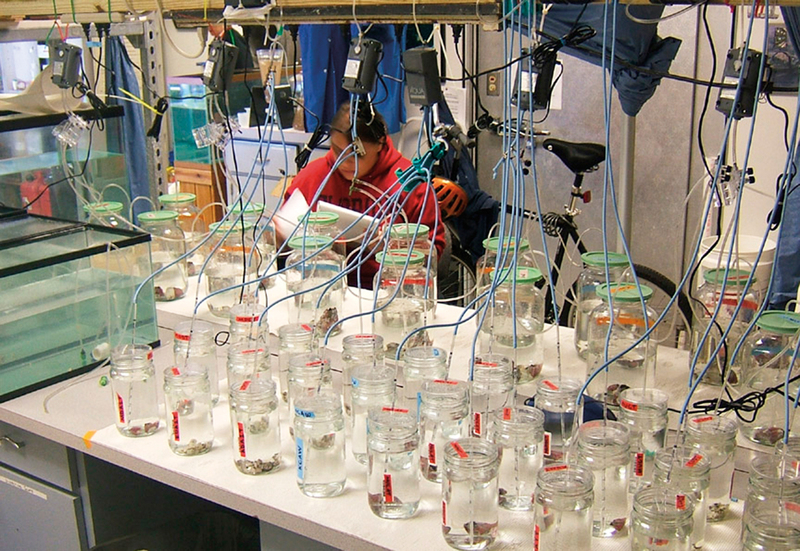 The researchers conduct monitoring of critical sites following up with chemical and biological testing for designing and developing solutions to lagoon problems. 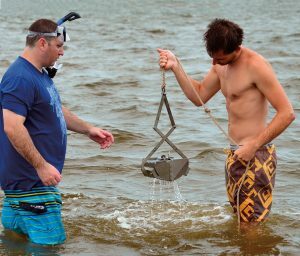 FIT has been engaged in lagoon science since the first alarms about the estuary’s health were sounded in the early 1980s at a campus symposium that included scientists from Harbor Branch Oceanographic Institute, the University of Florida, the University of Central Florida and elsewhere. That symposium inspired Diane Barile, a 1976 master’s graduate and adjunct faculty member, to form the Marine Resources Council, a nonprofit that still fights for a healthier ecosystem. She also led the charge to have the lagoon declared an estuary of national significance, bringing much needed federal money and attention. Although the Indian River Lagoon Research Institute is just six months old, FIT scientists already have been put to work on three projects worth more than $1.5 million aimed at getting to the bottom of the issues afflicting the estuary. Those issues start at the bottom, where thick, gooey muck has been accumulating since the 1950s, a problem Trefry has dogged for decades. He and professor Ashok Pandit—along with Jonathan B. Martin of the University of Florida—are working on an $865,000 contract from the St. Johns River Water Management District to examine how nutrients from the muck and other sources are spurring deadly algae blooms. More than five million cubic yards of muck is spread over the lagoon, forming what Trefry calls a giant compost pit. His job is to find out how much nitrogen that pit releases into the water. Pandit and Martin are focusing on nutrients that seep in from groundwater carrying fertilizer and effluent from septic tanks. Closely related to Trefry’s work is a $250,000 contract—also from St. Johns—issued to Johnson to study why superblooms like the one that fouled the lagoon in 2011 are not kept in check by microscopic animals that ordinarily gorge on algae. A zooplankton ecologist, Johnson wants to find out whether the algae is growing so fast that grazers can’t keep up, or whether they simply don’t eat the type of algae growing and if not, why not. The final project, a $453,144 grant issued to institute director Robert Weaver and professor of meteorology Steven Lazarus by the National Oceanic and Atmospheric Administration, involves developing hydrodynamic models that simulate the impact on barrier islands and estuaries from tropical storms and hurricanes—among them spreading muck from deep channels to shallow areas. Weaver, an associate professor of ocean engineering, also is working on a variety of practical solutions to the estuary’s problems. Is it possible to make dredging equipment that pulls muck up from shallow areas without killing seagrass? Would submerged barges of oysters and plants help reduce nutrients that fuel algae blooms? Is there a way to address the reality that the northern lagoon is not cleansed by the tidal flushing seen in the south? If locks at Port Canaveral were opened at high tide, would that generate circulation that flushes pollutants out the Sebastian Inlet? Weaver sees these kinds of innovations—as well as greater collaboration between scientists at FIT and other agencies and institutions studying the lagoon—as a key to solving the problems of the estuary and other troubled waterways. The institute arrives at a time when the stars seem aligned for change. The deaths of pelicans, dolphins and manatees—the “charismatic mega-fauna,” as Johnson dryly put it—and the toxic algae blooms that closed beaches in much of the southern lagoon over the summer spurred the public to action. Last summer, scores of people lined up on the beach in Martin County to spell out SAVE OUR RIVER. This fall, hundreds of citizens spanned causeways during Hands Across the Lagoon to demand that politicians act—reprising a 1990 protest that helped persuade federal officials to designate the estuary that year as one of national significance. Alumna Allison Randolph ’13 watched the Martin County protests from San Diego, where she was spending the summer, and decided she had to join the fight to save the estuary she had fallen in love with as a child growing up in South Florida. The result was “An Estuary’s Story,” a film about the troubles afflicting the St. Lucie River Estuary—and by extension the Indian River Lagoon—that has aired on public television, played in the Beneath the Waves Film Festival, appeared on newspaper websites and been shown on You Tube. It is an unabashed call to action. “I felt that if someone young, educated, passionate and local, like me, created an educational and motivating piece, that it could be really powerful in keeping that amazing advocacy momentum going,” Randolph said. She was not alone in using the power of film to advocate for the lagoon. Recent Ph.D. graduate Lauren Toth and doctoral student Philip Gravinese teamed up to create “The Indian River Lagoon: What the Muck? !,” which explores problems created by the black ooze that is 13 feet deep in parts of the estuary. Their video also was featured at Beneath the Waves, a festival dedicated to educational films about marine issues. Toth and Gravinese took their advocacy one step further last fall by launching Youth Making Ripples, a spinoff festival that challenges K-through-12 students to make five minute videos about environmental issues. More than 100 films from were submitted from around the nation—the majority from Brevard County—and about half of them focused on the Indian River Lagoon. The response was inspiring. “There are so many people engaged about this issue,” Toth enthused. Public advocacy has begun to produce results. In March, Brevard County banned the use of fertilizer in unincorporated areas during the rainy season, a measure scientists believe will have significant impact. In December, Trefry made the case to state lawmakers for spending $20 million to dredge muck from the lagoon and provide FIT’s new research institute with financing to monitor the ecosystem’s recovery. To emphasize his point, he brought each lawmaker a baggie of “Genuine Indian River Lagoon Muck” and warned them not to open it because the foul smell would instantly clear the room. From long experience, Trefry knows the challenges that lie ahead for the fledgling Indian River Lagoon Research Institute—keeping the public engaged over the long haul and finding the money needed to do real science. But he also knows that FIT brings scores of allies to the battle—its vast network of graduates engaged in lagoon science, many of them his own students. People like Joel Steward ’80, who recently retired after 34 years as an ecologist at the St. Johns River Water Management District, or Ron Brockmeyer ’89 and Lauren Hall ’97, who continue to do important science there. The challenge is daunting, but institute director Weaver reminds Floridians that they need not look far for inspiration. In the 1980s, Tampa Bay’s estuary was in deeper trouble than the lagoon, but scientists, public officials and business leaders pulled together in a concerted effort to restore the waterway.